The River Basin is your place for information and supplies when it comes to fishing, either on the magnificent Hudson River or on lakes and streams in the beautiful northern Catskill Mountains. Hudson River bass fishing is one of our specialties. 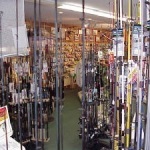 We are a specialty outdoor store featuring rods, reels, accessories and thousands of fishing lures as well as live bait. We can even wind your line for you. Our shop can provide the equipment and the information you need to enjoy your outing in our great area.